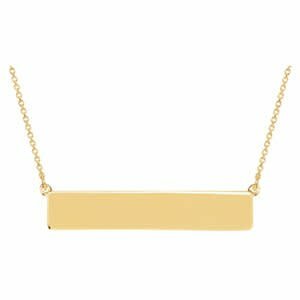 Ladies engrave-able bar pendant of contemporary styling crafted in 14k yellow gold. The pendant is held stationary by a rolo link necklace. Engraving of up to two names on this item is included in the price. Please leave engraving instructions in engraving inscription box under the item's description. For any additional engraving, call us in store!